Flash, retro-vintage Electro-Disco constructs, backd with prime remixes from Dutch masters, Flemming Dalum & Steen Gjerulff, and Mike Salta. Bandido's Gang - aka Bill Ambrose and Casionova - play it ice cool with the shaded synth gazes and muscular arpeggios of 'Marinche' and the strutting pulse of 'Last Train To Tucumcari' for all the intercounty peacocks out there. 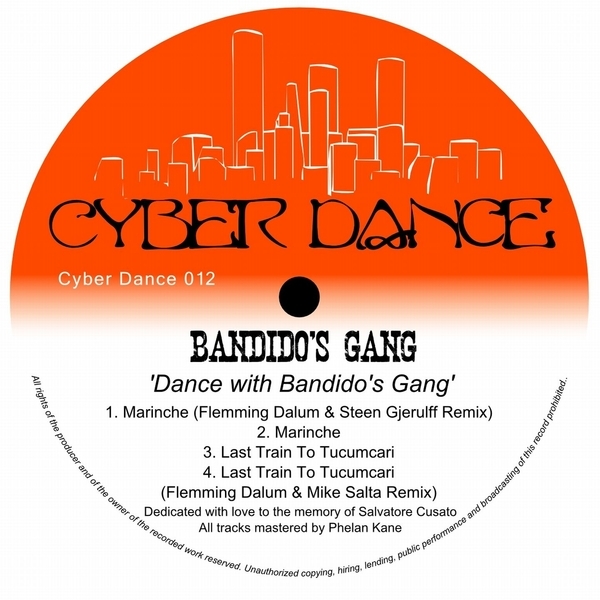 Remixing, Flemming Dalum & Steen Gjerulff give 'Marinche' a fatter analogue polish, whilst Flemming Dalum & Mike Salta decelerate 'Last Train to Tucumcari' to savour the ride.